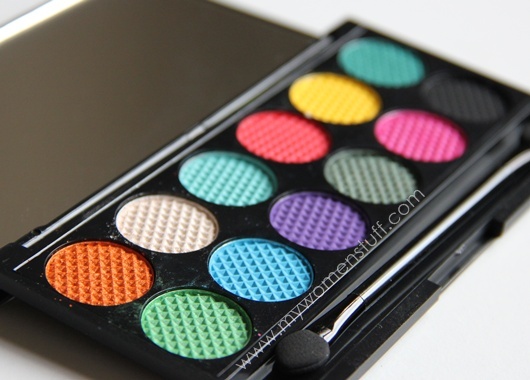 This Limited Edition summer collection comprises the Curacao i-Divine eyeshadow palette US$10.50 (look at those colours! 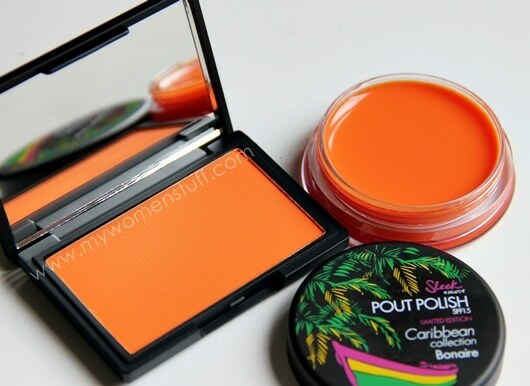 😯 ), Pout Polish in Bonaire US$7.80 and Aruba Blush US$6.50. Not colours for the faint-hearted! 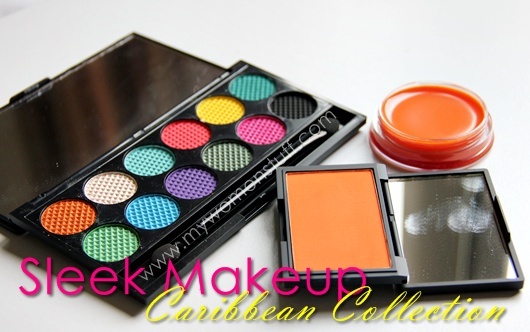 Sleek Makeup Curacao i-Divine eyeshadow palette – Quick! How would you wear these colours? The Sleek Makeup Curacao eyeshadow palette has names! Its a lot easier than just going “the blue on the bottom left” right? 😉 Granted, they are printed on the plastic sheet that comes with the palette and that can get lost quite easily but its still better than nothing. 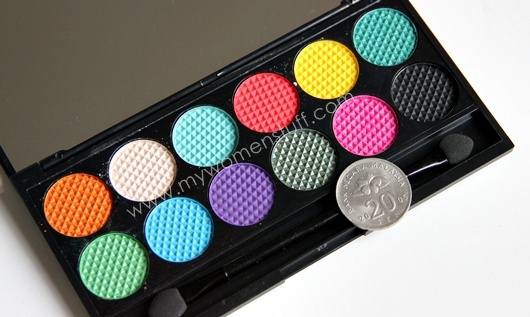 The palette is a good size and with 12 shades in there, you would have a good time playing mix and match. The shadow pans are a little small though. Here is a picture with a 20 sen coin for an idea of size. Not very large, but you don’t need very much colour either because these are seriously pigmented. Well, some of them anyway. 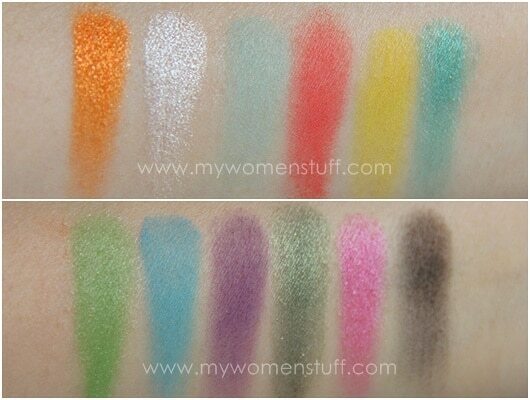 I personally found that colours with shimmer (Tequila Sunrise, Martini, Green Iguana, Apres Midori, Green Martini, Singapore Sling) were gorgeous. 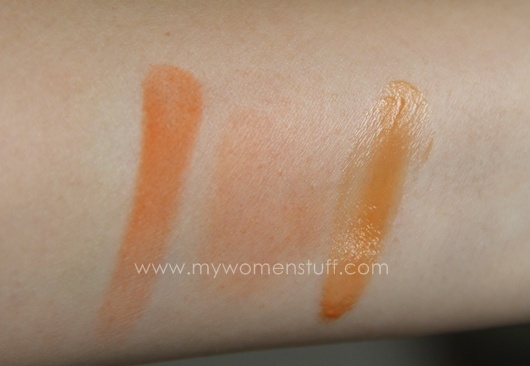 They swatched like a dream and were very pigmented. They also aren’t super shimmery and texture wise are very wearable. The matte shades (the rest 😛 ) however took a bit more work. The colour with the poorest colour payoff is Blue Hawaiian which took about 4 layers to get the colour you see here. Espresso Martini (Black/dark brown) does not swatch well with fingers but applies very well with a brush. Gio has the same conclusion about Blue Hawaiian – could do with a bit of work. The Aruba Blush (bright matte orange) troubled me the most. It reminded me of NARS Taj Mahal – a burnt pumpkin shade – that I did manage to to work but took too much work to justify keeping it. Applied lightly to the skin Aruba blush takes on a bit of a coral tone on my skin. I must be careful to apply with a light hand though. I use my Sigma F10 Powder/Blush brush – dab lightly on the surface of the blush, tap off excess and apply to skin. Repeat for more colour. I also find that topping up with a pink blush brings out the colour better. Here are a couple of looks I did (all the cheeks and lips are the same i.e. Aruba Blush and Bonaire Pout Polish) its just the eye colours that change. As you can probably see from this picture, the Aruba blush isn’t all THAT scary 😉 Also, I found that the red turned a little purplish on my skin but when blended with the black, and used sparingly, it did work well enough. I never thought it would! Eyes: Green Martini (shimmer dark grey-green) all over lid, Green Iguana (shimmer teal) outer corner, Apres Midori (matte green) outer corner of lid blended with Martini (shimmer cream). Blue Lagoon (matte blue) on lower lid. Aruba blush and Bonaire Pout Polish. I love greens and I’m quite happy that the greens in this palette play well together as well as separately. The colours blend well and very easily and I really like that Martini shade for blending all the colours together as well as for a touch of highlight. If sold as a single, I’d buy it in a heartbeat! Eyes: Espresso Martini (matte black) to line and blended with Tequila Sunrise (shimmer burnt orange) with a touch of Screwdriver (matte yellow) in the inner crease. Blended with Martini (shimmer cream). Aruba Blush and Bonaire Pout Polish. This was a bit of an afterthought for me. I wanted to try that burnt orange shade but I wasn’t sure how to. I eventually decided that black shadow goes with everything (believe me, it does!) and I was really happy with how it turned out. Its not garish nor too bright and I’m going to wear this to work haha! I don’t have much to say about the Bonaire Pout Polish. You need a lip brush to apply this and there isn’t much colour. Its a tinted lip conditioner – a lip balm lip gloss – and I find that it does not give too glossy a finish although it does make my lips feel a bit moisturized. Its very sheer on my lips. I think if you layer this over a red or pink, it’ll come out a very pretty coral shade. I’m not much of a fan unfortunately. Perhaps in a different colour, I might change my mind. Pros: Eyeshadow shades are lovely and pigmented in the most part, Eyeshadow colours blend well and colours are picked up very easily with a brush, Texture of the blush is nice although the colour may not be for everyone, Affordable products with good colour pay off. If you have friends in the UK who can get this for you, tell them to take a look in Superdrug but from experience, the displays usually don’t have many palettes available. Otherwise, it is also available online at Sleek MakeUp which also ships internationally for US$13.50. My suggestion is to get a few friends together to place an order – shipping, once shared, damages the pocket less 😉 I’m actually keen to try the Rose Gold blush – it looks pretty! Disclosure: Featured products were sent by the manufacturer for consideration. For posting guidelines please read my disclaimer. NEXT POST: Visiting an Onsen or Oncheon : What do you really do or wear at the hot mineral springs baths? those colors are AWESOME! it’s kind of tough to get these shades in m’sia i bet~ and in one palette =D nice nice! i just gotta <3 this post! I’m not sure what other brands will have these colours in one palette 🙂 But it really is nice and the pigment is scary good LOL! Thanks Yumiko! the Aruba Blush and Bonaire Pout Polish had me a bit shocked at the orange shade, but it looks pretty decent on you. 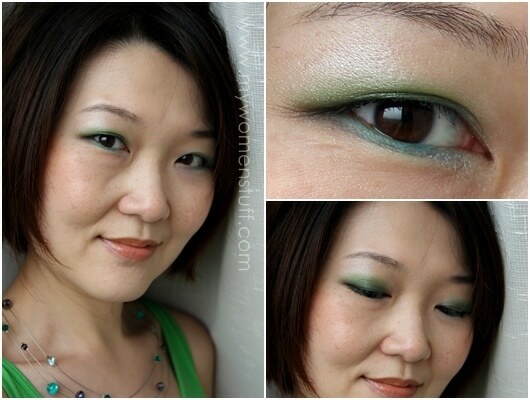 not sure I’d be able to pull it off, but the Curacao i-Divine palette looks interesting – <3 the green and blue shades! i loveeeee these palette.. the colors really catch my eyes. I love bright colors and always wearing bright..
btw, i love your 1st and 2nd look its compliment ur shirt..
Actually, I do have an orange-like blush. MAC’s Peaches, heh heh heh. It works on me because I’m so freakin’ dark. Also, I’m loving the colors of the eyeshadow palette, especially the yellow! Quickly from memory, Aruba is matte while Taj Mahal is shimmery and Taj Mahal has this interesting red undertone which this doesn’t. This one’s a little like Gina too 😉 You would definitely rock these Jenn! 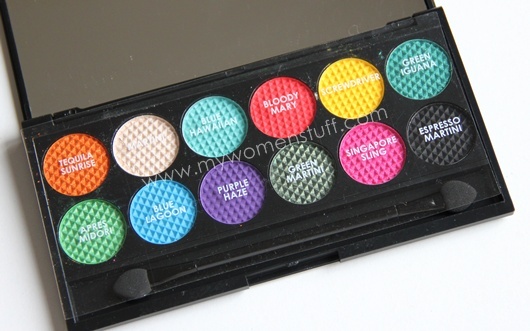 when i saw the palette i thought, urghhh… like colours of the 80’s… but on you, they look really wearable. i especially like the last look. I suppose the blue-green look on your eyes is not meant for the office? aww…. me heart look 1!!!! the red turning purple is so nice and it makes u look young n fresh!! I feel like having a pina colada just looking at these colours! Lovin your concoctions PB! You look more gorgeous in green because it brings out your fair skin. These are amazing and I just got their palette from this winter from a friend as a present and totally love it! Oh my goodness! I love SLEEK palette! I like how colorful these are!!! So summery! and I’m not surprised you look good with colored e/s!!! Hmm… I’m not so into the Pout Polishes but their shadows! Goodness! Lucky you for being able to pick it up in person AND get a discount on top of that! Ooohh…I love bright colors. I just compiled a palette of bright colors from Inglot. Thanks for this info, will definitely check it out! I have always wanted sleek!!! These are gorgeous!